Enclosure Movement | Notes from the U.K.
Every country has a mythology about itself, and the countryside figures heavily in England’s. Never mind that three-quarter of the population (give or take a few percentage points) lives in cities–or urban areas if we’re trying to sound impressive about this. When England looks in the mirror, it sees countryside: green fields, shiny clean lambs, and hedges. I’m limiting this to England, leaving out the rest of Britain, whose history and laws are different. And against my better judgment, I’m counting Cornwall as part of England. That’s not a statement about whether it should be part of England or culturally is part of England. The law treats it as part of England and I know enough about its hedges that I don’t want to leave it out. So all you Cornish nationalists, grab a cup of salt and sprinkle it over your computer screen. I’m talking about hedges here and nothing else. 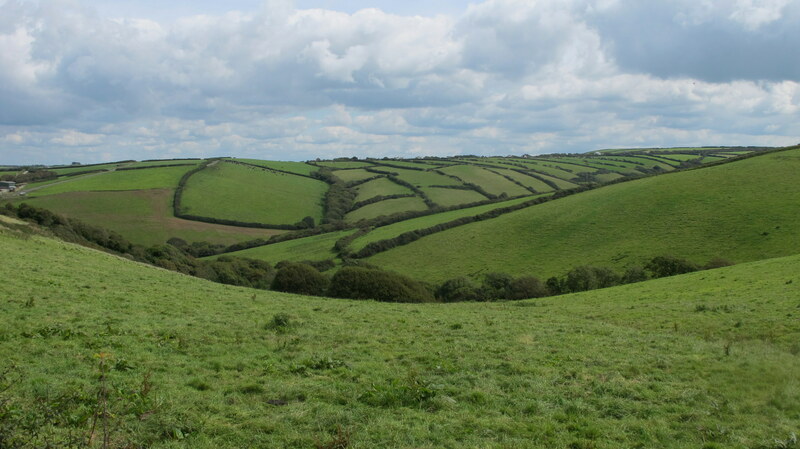 A rare relevant photo: Cornish fields divided by hedges. If you’re new to hedgeology, you can think of the hedges (at least the ones that aren’t made of bare stone) as long, narrow woodlands. They grow crops and they shelter and feed wildlife and provide them with safe travel routes. They also define field boundaries, look gorgeous, and embody both history and tradition. Back when rural life was all about staying alive from one harvest to the next, they were an important source of fruit, nuts, wood, and medicine. They were valued for that as much as for their ability to define and divide territory. And the stone ones? They do most of that but for the bare ones you can forget the long, narrow woodland part. Why am I mentioning stone walls when this is about hedges? Because the Cornish hedge is made of stone. Some are so heavily covered in plants that you can’t see the stone undernearth and some grow nothing more than a few volunteer wildflowers and small plants. You can find stoneless hedges here, but stone ones (according to my small and unscientific survey) outnumber them. Cornwall’s rich in stone. It’s not a great way to get rich in either money or food, but stone comes with the territory so people put it to use. The hedges we’re talking about here aren’t the simple lines of bushes you find around a city or suburban yard–or garden if you’re British. Traditionally, you start by planting some trees or bushes in a line, but then you cut the trunks part of the way through and bend everything above the cut to one side. After that I’m out of my depth and have to refer you to a video. A well-maintained hedge is an effective border, and hedging’s a skilled job. In the Cornish hedge, the stones are traditionally laid without mortar. That means you have to pile the damned stones up so that they don’t wander off. A good stone wall can last for hundreds of years. A bad one? Well, I built a bad one and I have to put the stones back in place several times a year. Not all of them, but enough to remind me of the difference between a good Cornish hedge and a bad one. So that’s a skilled job as well. Pre-Roman Britain was tribal and its hedges wouldn’t have indicated individual ownership so much as use, or possibly group ownership, although I’m not sure how well the modern idea of ownership translates to that period. It wasn’t until the Roman occupation that hedges began to mark individual ownership. Somewhere between not much and nothing at all is left of those early hedges. Hedges need upkeep, and what needs to be fenced in or out changes, so some wouldn’t have been worth the bother of maintaining. And although rock may last more or less forever, if you build a wall out of it, the wall itself will need maintenance. Still, even if they’d all disappeared completely, they set the pattern. Hedges had become part of the landscape and they were a tool farmers could reach for. We’ll get to enclosure in a minute. We won’t get around to why a North Wales organization is writing about England’s hedges because I don’t have an explanation to offer. I read somewhere–it’s lost now, so forget finding a link–that you can tell the age of a hedgerow by the variety of blackberry plants in it. The greater the variety, the older the hedge. This is useful if you can tell one variety of blackberry from another, but I can’t. What I can tell you is that blackberries not only grow wild in England, they do it enthusiastically. The fruit’s nice but they’re thorny and they build tiny engines to spread their seeds to new places (these are called birds), and one night they’ll reach through every bedroom window in the country and strangle us all in our beds. They’re only waiting for the signal. You can also tell the age of a hedge by the variety of species in it. They add roughly one every hundged years. I think that’s in a thirty-meter stretch. It all has to do with Hooper’s Hedgerow Hypothesis. I can’t can’t put Hooper’s hypothesis to work, but I can tell you that some hedges are old. The 13th century marks the start of the Enclosure Movement, and hedging more common. Enclosure meant that large landowners, and occasionally smaller ones, enclosed–used a hedge to fence off–what had until then been common land. That allowed the landowner to claim it as his own, and in this period the landowner would almost invariably have been a his. Common land was recognized in feudal law, which gave the juiciest rights to the lords but granted some to the peasants, and the use of a common–a piece of land owned by the landlord but set aside for the tenants–was an important one. And yes, the common is, at least in part, the origin of the word commoner. Even today a commoner is still someone with the right to use one of the few surviving pieces of common land. The commoners’ rights were clearly defined. They might be able to graze animals, gather wood or reeds, fish, dig peat, or take sand or coal. The specific rights varied from common to common. Even though the commoners didn’t own the common, their rights were clear and protected by law and tradition. Until suddenly they weren’t and commoners found the common pulled out from under them. We think of feudalism as oppressive, and it was, but as feudalism broke down former serfs found themselves personally free but also homeless and starving, which didn’t count as an improvement. This was a time of impoverishment, eviction, unemployment, uprooted people. The wool trade became the base of the English economy, but the shift left it dependant on foreign grain and prone to famine. Hedges became a greater and greater part of the English landscape. Starting in 1489, Parliament passed eleven acts over 150 years to stop enclosure, to limit its effects, or to fine the people responsible for it, all without managing to stop the process, although it may slowed it down and prevented even greater social havoc. By the time the Civil War began (that’s 1642, according to Lord Google), Parliament’s leaders supported the rights of landlords. The king had been serving as a brake on enclosure, but with the overthrow of the monarchy, the brakes were off. By about 1650, wool prices had settled down and wool was no longer driving enclosure, but changes in farming practices continued to. Large-scale farming was more profitable than small scale. Their legacy echoes on, though. Wigan has a yearly festival commemorating them. This year’s features a list of musicians that includes Attila the Stockbroker, whose website describes his group’s latest album as “early music meets punk.” I can’t claim to love his voice but his name? Why didn’t I think of it first? Fast forward, then, to modern times. With the introduction of tractors, farmers fell out of love with hedges. A bigger field’s easier to plow, and this may well have been true back when they still plowed with horses. This led to some hedges being torn down and others being allowed to decay, but depending on their length, location, and importance, it can be illegal to tear out a hedge. Some are protected by a law from the 1990s and others, in a nice piece of irony, by ancient enclosure laws. Conservationists watch over them carefully, because they’ve become an important part of the ecosystem. I was going to list the animals, insects, birds, and plants that hedgerows protect and are made up of, but the quotes lean heavily and unsuccessfully toward poetry, so maybe we’d do just as well to skip them. Hedges keep long lists of wildlife and plantlife alive. For our purposes, that’s enough. They also slow field runoff, keeping soil and fertilizer in the fields and out of the rivers. They capture carbon and pesticides. They embody a part of England’s history and self-image. They’re also incredibly beautiful. So here we are, protecting the hedges that once destroyed a way of life.